Gen-next designers showcased their neo-futuristic designs in loose silhouettes and billowing layers. 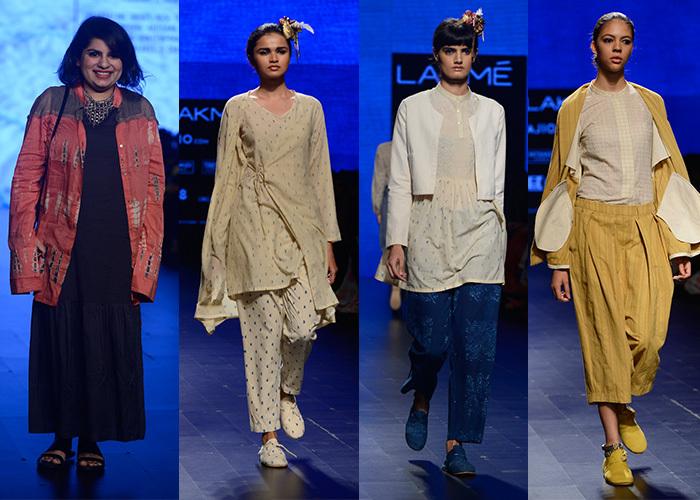 Pallavi Singh harnessed the power of indigo as her colour base along with a fusion of cotton and Chanderi. 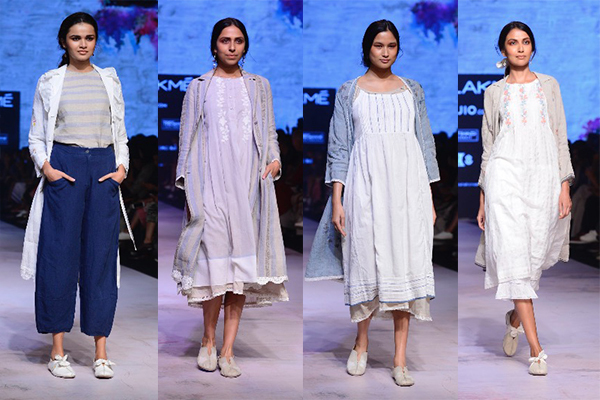 With nature as the theme, Nakita Singh started her showcase with black/white creations and used embroidery on natural fabrics like khadi and linen to present a cool summer look. Poochki focused not only on Indian textiles and hand crafts but also projected their imaginative fauna prints with block carving and printing. The Pot Plant presented a gender fluid line with anti-fit as the basis of the silhouettes. Using pure cotton in fresh staple shades, the neutral cuts along with hand embroidered floral motifs were ideal for the steamy months. 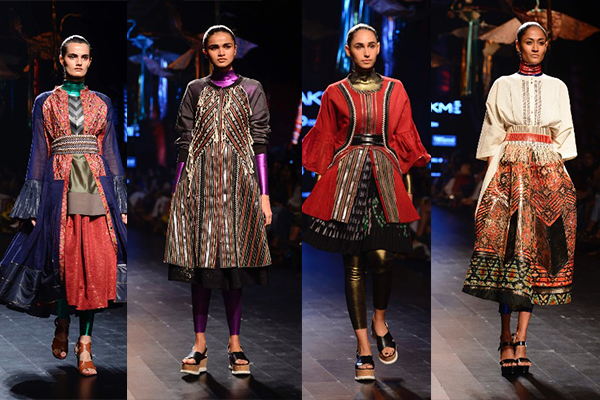 Soumodeep Dutta showcased an innovative line of garments inspired by sari drapes which had versatile garments’ backs often turned into the fronts and vice-a-versa. Rich indigo and khadi separates in a primary colour palette bought seasonless fashion to the forefront. Fluid tent dresses, comfortable indigo-dyed skirts and relaxed long-sleeved blouses were reminiscent of languid summer months. 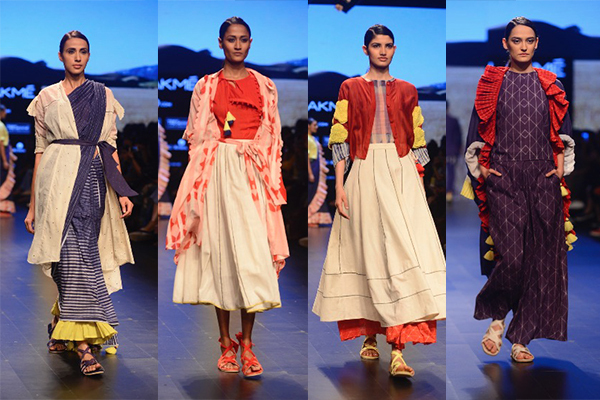 The Kantha patchwork line of jackets and the draped dress story were some more additions to the label’s new collection. Pleated slip dresses layered with soft kofta jackets and overlays, saris paired with kurtas in an earthy colour palette were only a couple of the delights seen at Urvashi Kaur’s show. The garments were a perfect blend of conventional clothing with a gypsy touch. Ka Sha kicked off her showcase with looks in dusty purple before moving on to whites tie and dyed with edges of green, blue and yellow. Colourful tassels, ruffles and crochet flowers were used to ornament the clothes. Her collection brought out joyful summer layering at its best. 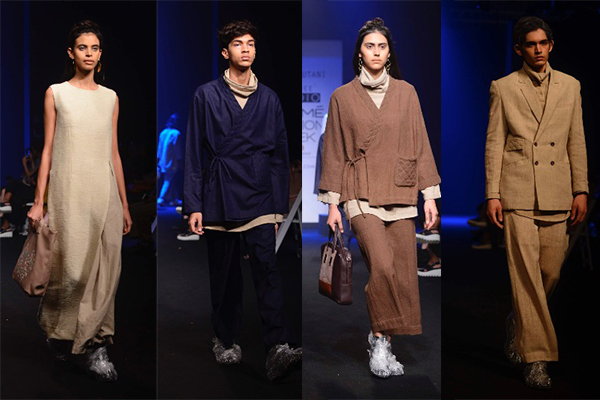 Antar Agni’s collection used solid white, black and beige to create softly tailored looks. The strength of the collection lay in its modern take on Indian menswear. 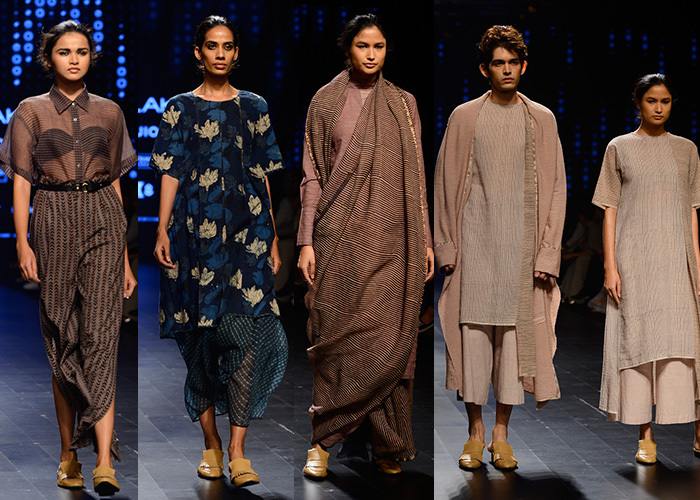 Anuj Bhutani’s gender fluid collection in linen comes with a sophisticated charm. Minimalistic pairings and clean but laidback outerwear stood out. Kunal Rawal continued his use of innovative textures and sleek separates to create modern Indian and Western formalwear for men. 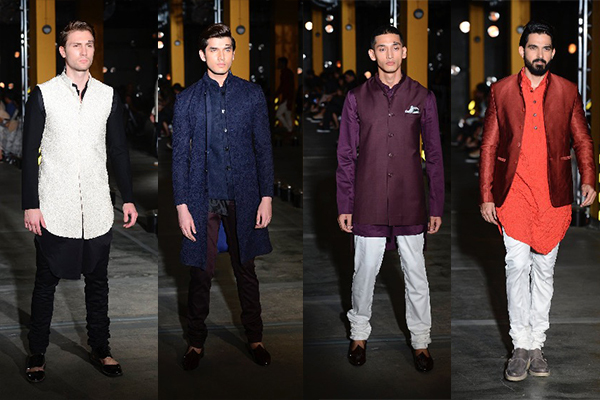 Marking his foray into separates for the first time, there were jacket kurtas, longline bundis, and high-low kurtas. Eka looks to pastel wallpaper prints and traditional lace inlays for inspiration. 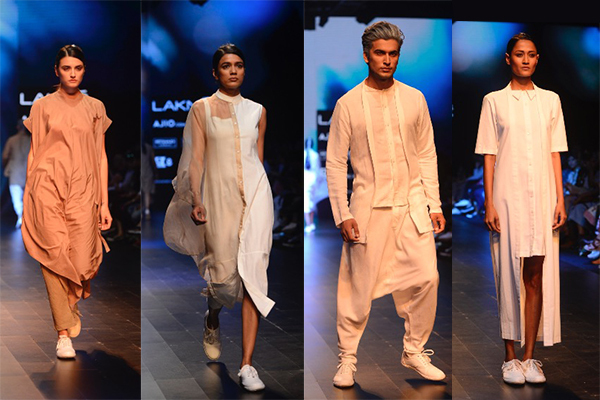 Vintage whites and faded natural linen stripes are reminiscences of a Goan summer vibe. The relaxed styling coupled with the rawness of natural fibres make a strong case for ‘soulful clothing’. Amit Aggarwal breathed new life into old patola saris by upcycling them intro new creations. The silhouettes were voluminous, the textures juxtaposed and the woven metallic belts, the coolest. As usual, the designer managed to create his version of order from chaos.